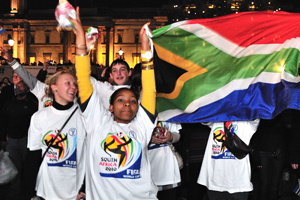 South African Tourism joined football fans in Trafalgar Square on Friday to celebrate the announcement of the 2010 Fifa World Cup draw. The tourism office's team led almost 600 fans in a performance of South Africa's traditional Diski dance as the draw was broadcast live on giant TV screens. Agencies experienced a surge in demand from UK clients for corporate hospitality packages, following the announcement of where England's group matches would be played. Sportsworld chief executive Chad Lion-Cachet said: "We have had a huge number of enquiries from corporate clients and we're pleased that many of them are looking to incorporate incentive activities in their trips to South Africa. In terms of industry sectors, there's a slight swing towards financial services but the interest is coming from across the board, and from big and small companies."